The Community Leadership Council (CLC) in partnership with Metro invites you to come learn about business and professional opportunities at the Metro Business Opportunities Summit. The Summit is a forum for Metro to inform and educate local small businesses around South Los Angeles about the broad range of economic opportunities. During the Summit, both Metro and Walsh-Shea Corridor Constructors will highlight the broad range of their respective business opportunities and non-construction-related professional career options that will be available on the Crenshaw/LAX Transit Project and other transit projects. 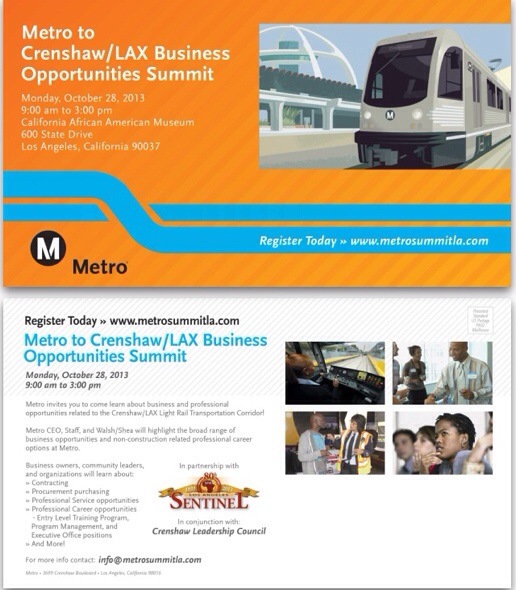 The Metro Business Opportunities Summit is taking place on Monday, October 28, 2013, from 9am to 3pm at the California African American Museum located at 600 State Drive, Los Angeles, CA 90037. For more info contact info@metrosummitla.com.